Moose photos, bull moose, cow moose, moose calves, photos of moose in Denali National Park, and Wrangell – St. Elias National Park, Alaska. 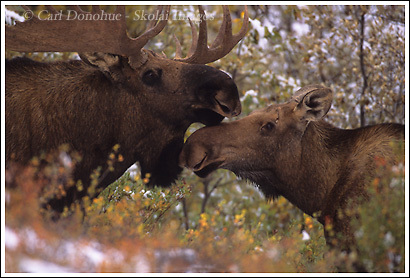 Moose Rack, Wrangell – St. Elias National Park, Alaska. 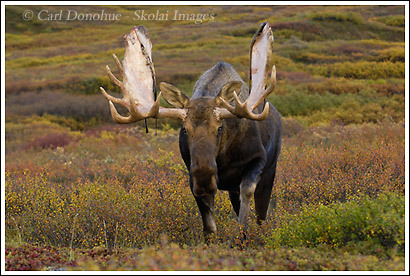 I ran across what is easily the biggest moose rack I’ve ever come across in the woods a few days ago. 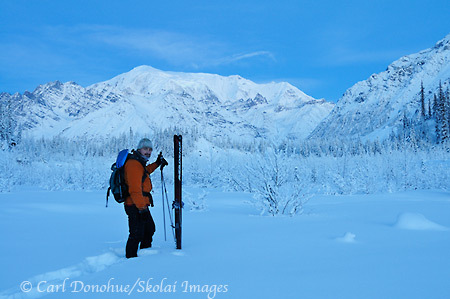 I was on the last leg of a hike in Wrangell – St. Elias National Park, from the Sanford River drainage over the Sanford Plateau, and down to the Dadina River. Natalie (pictured) and I were sauntering through the forest, along the Dadina River when I spotted this rack, not far from the game trail we were walking along. 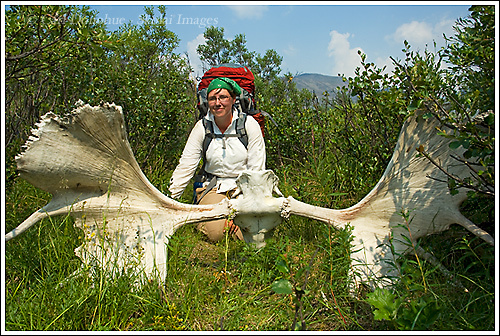 This was one BIG bull moose – I don’t know what happened to the grand old fella, but he’s bones now. He must’ve been a pretty awesome creature back in the day. There are a number of wolves in the area, and grizzly bears as well, and I’m sure he fed them well, along with the myriad other carnivores in the region – wolverine, fox, marten, gulls, ravens, eagles, etc. What a treat it must’ve been for them when he passed, and what a treat it would’ve been to see him walking through the forest beforehand. RIP, great bull. Some of you might remember I did this hike last summer, and we found this awesome natural ice arch on the Sanford Glacier. Sad to say, the arch has had its day. We hiked up the moraine and crested the ridge right before the arch, only to see a huge gaping gap between the 2 side walls – no bridge at all. Ironically, a couple who were up there the week prior to our trip said the arch was still there, so we only missed it by a few days. 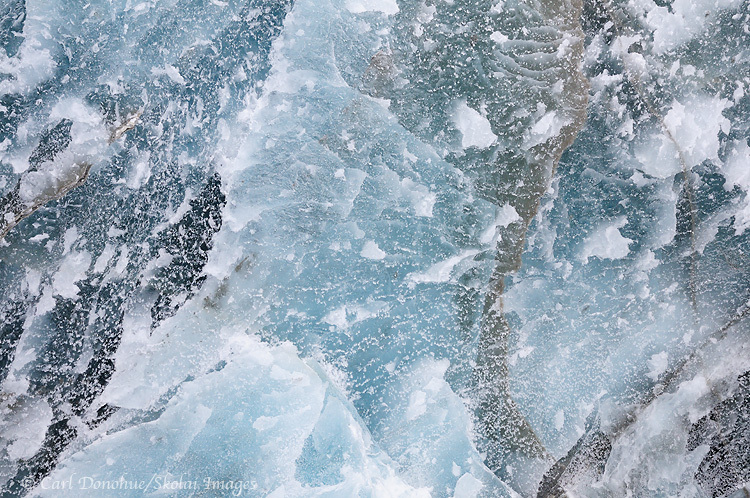 It seems the arch collapsed under glacial movement, not melting, as the left side of the gap is noticeably higher than it used to be – in fact, the wall ascends away from the gap, where it used to descend. 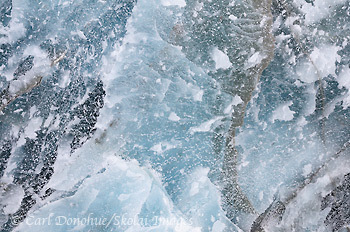 So I’m pretty sure pressure from the glacier caused the collapse of the arch, not melting – though melting may have been a contributing factor, as the summer has been hot, hot hot so far. Except, of course, for the day we hiked up to the now gone arch – it rained like a sonuvagun that day – so no pics of the fallen arch. I should’ve taken a picture, instead, of me, drenched to the bone, in my failed (and now history) Marmot Precip raingear. The jacket and pants had done their time and now are beyond redemption. Fortunately, it didn’t rain again for the rest of the trip until the final night, when I was tucked away in my very dry tent. I should’ve known better than to carry my old gear, but I thought it might still work reasonably well. Alas, it didn’t and I got a soaking. Toughened me up though. Heading out tomorrow for a week at Skolai Pass. Woo hoo. I’ll try to schedule another post while I’m away, from this last trip, but it’s hard – summer’s the time for hiking, not blogging. This entry was posted in Adventures, Alaska, Backpacking and Hiking, Moose, People, Wildlife, Wrangell - St. Elias National Park and tagged backpacking, hiking, Moose antlers, Wrangell - St. Elias National Park, Wrangell St. Elias on July 16, 2009 by Carl D.
Here’s a quick one while I’m hiking. 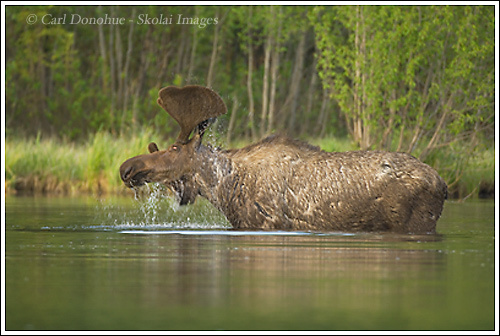 I saw this bull moose a few times this spring, feeding on the aquatic plants that grow on the lake bed this time of year. Quite a rack for early June. 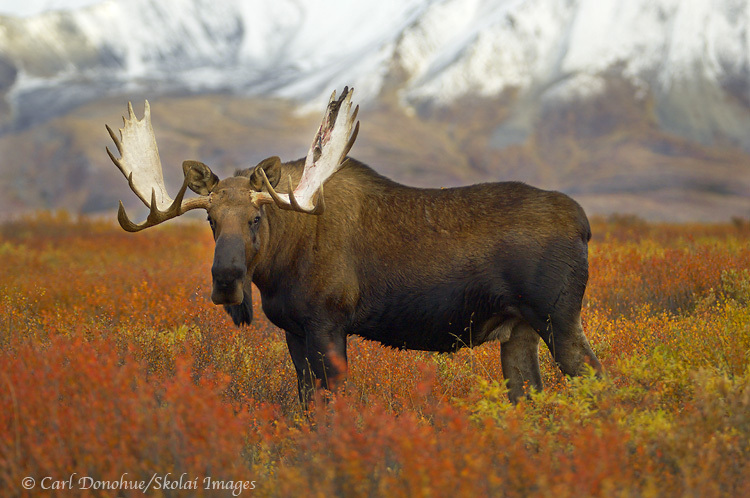 He’ll be quite a sought after moose come this fall when the subsistence hunters look around Wrangell – St. Elias National Park for their winter meat. As much as I like for my friends to eat well, I hope nobody gets this guy. 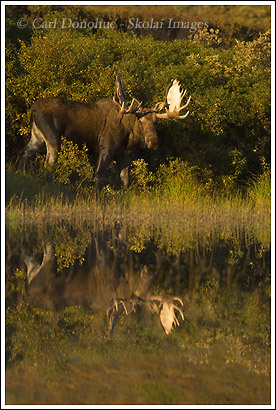 This entry was posted in Alaska, Moose, Wildlife, Wrangell - St. Elias National Park and tagged Alces alces, Bull Moose, Moose, Wrangell - St. Elias National Park, Wrangell St. Elias on July 1, 2009 by Carl D.
Here’s a young bull moose, a yearling, trundling through the snow. Moose have disproportionately longer legs than other members of the deer family, and it really helps them get through deep snow. This is a helpful advantage as they seek out food in the winter, and also in evading their main predator, the wolf pack. But the real secret they employ is a kind of double-jointed hip or knee that allows them to lift their legs higher than most ungulates, and high-step their way to safety. When I first saw this fellow, he stepped into a deeper drift that was right up to his belly, yet he managed to clamber his way through, regather, and then set about finding himself some browse for dinner. 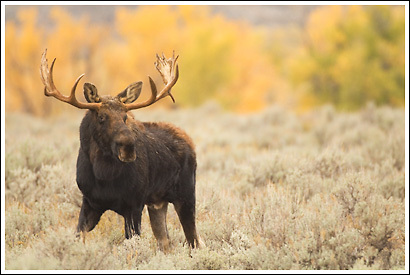 The word ‘moose’ comes from a North American Indian Tribe, the Abenaki, and it translates roughly as ‘he trims or cuts off’, a reference to how the Moose browses twigs and bark from trees. 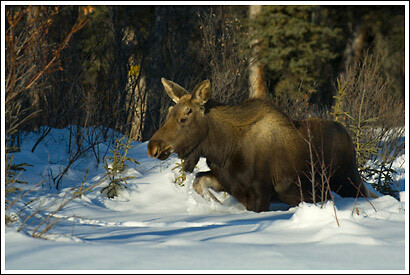 This entry was posted in Alaska, Moose, Wildlife, Winter, Wrangell - St. Elias National Park and tagged Moose, Wildlife, Winter, Wrangell - St. Elias National Park, Wrangell St. Elias on April 12, 2009 by Carl D.
This entry was posted in Alaska, Art, Denali National Park, Moose, Photography, Wildlife on October 22, 2007 by Carl D.
This entry was posted in Alaska, Denali National Park, Moose, Wildlife on October 18, 2007 by Carl D.
This entry was posted in Moose, Photography, Wildlife on October 5, 2007 by Carl D.